Zebronics India Pvt. Ltd, supplier for IT peripherals, Audio/Video and Surveillance products, recently announced the launch of its newest pocket size savior, the black beauty ‘ZEB MC12000PD Power Bank’ with 11,720Mah capacity, which not only looks good but brings a straightforward answer for performance too. With its seriously good looks and cutting edge features, ZEB 11,720mAh continues the philosophy of good products at affordable prices. Sporting a smooth streamlined design and bold looks, this new age gadget comes with an array of features making it an appealing choice for today’s young generation who demands to the finest. The emergency power bank is not just light weight but also designed compact allowing you to carry it anytime anywhere. Having a competitive advantage over is predecessors, the ZEB-12000PD features a digital LED Display that tells you the exact amount of power left in the device, for facilitating optimum daily usage. Crafted for heavy duty performance with two USB ports for simultaneous charging, 11,720mAh charges your gadgets round the clock. Having powerful output of 5V/2A, the power bank, enables faster charging which kick-starts your gadget for use in no time. Fabricated with Lithium Polymer battery Zeb – 12000PD can fully charge most smartphones upto 4 to 5 times. It also comes with convenient torch light. Action packed with the massive capacity, delve into the world of uninterrupted fun, guaranteeing non-stop music, chatting, movies and browsing emails, minus the battery fright! Giving Key prominence to safety, Zebronics adds best in class safety features like over discharge and over voltage protection, high temperatures etc to ensure that you get a safe and sound charging experience anytime, anywhere. Compatible to most of the devices the black beauty is available with leading retail stores across India. 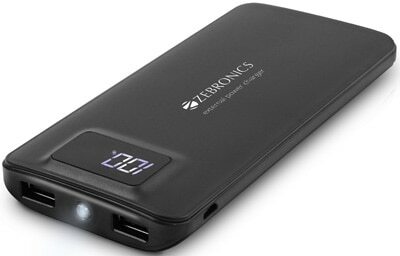 Zebronics Rolls out 1,720mAh Power bank ZEB-MC12000PD with fast charging 0 out of 5 based on 0 ratings. 0 user reviews.